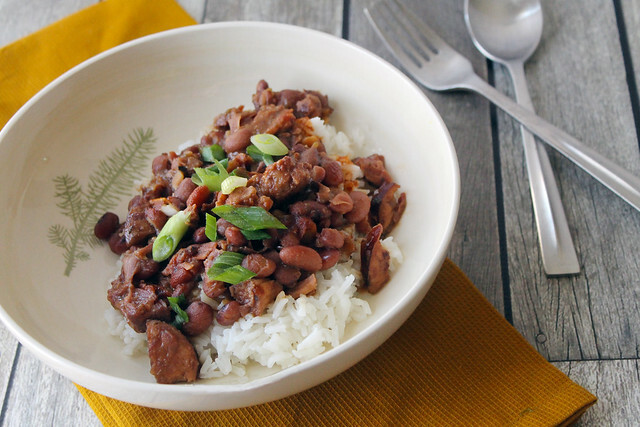 A girl born and raised in New Jersey has little business chiming in about what makes a great pot of red beans & rice, let alone offer you a recipe. In fact, I can’t say that I’ve even had this dish more than a handful of times and, I’m sorry to say, about one third of those instances were from a fast food chicken joint that was on the way home from work during my days spent living and working in Washington, D.C. 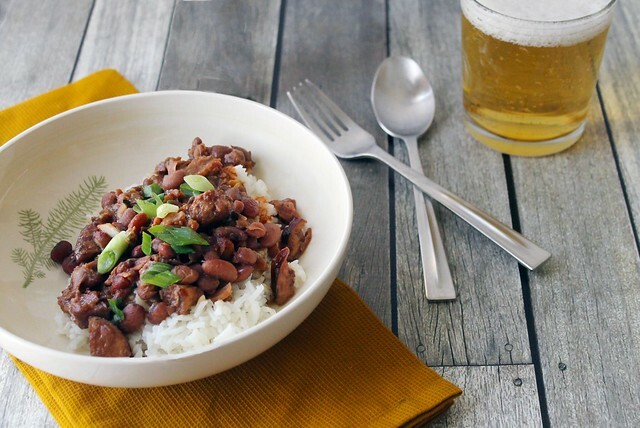 When I have had red beans and rice out at a restaurant or, best of all, from a friend’s kitchen, I’ve savored it for its smokey, bold flavors, but also for the comfort and warmth it brings. Red beans and rice just feels homey even when its origins are far from any place I’ve ever held an address. Before making these, I devoted more research to their recipe than I care to admit. I’ve been pinning and clipping recipes for years, but I’ve also tagged a few cookbooks and scribbled down notes when I’ve seen it on menus, in magazines, or featured on a cooking show. My archive of red beans & rice recipes is impressive, but to be honest, the thought of trying to create a pot myself felt intimidating. 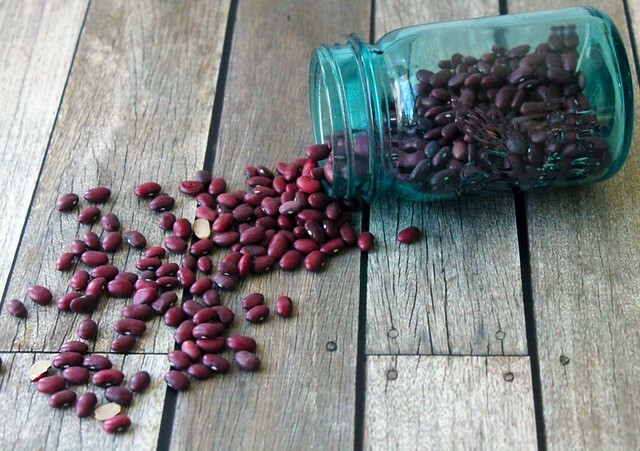 For one, I’ve never made dried beans before of any variety, nor have I seen my mother do it – an assurance that always lends me confidence vicariously. Would I be able to cook them to the correct amount of doneness? Would my beans be bland and like stones or mushy and without texture? I worried about making a big pot only to lose it on the beans and have wasted all of the very precious ingredients they call for. See, even if red beans and rice is a fairly cheap dish to make, the idea of ruining even a $2 ham shank and a piece of smoked sausage is enough to leave me stalled. I finally turned to my grandmother for council one day recently while on the phone discussing her prior travels through the American South with my grandfather a few years before his death in 1992. She shared some stories I’d never heard before. Charming details about a banana cream pie slice eaten for breakfast in Louisiana and the best peach jam she’d ever had in Tennessee; one she continues to chase in her annual attempt at making homemade preserves each July. And so it was, one idiot, NJ born and raised, pulled from this recipe and that, with the confidence of at least two generations behind her, and made the tastiest pot of red beans and rice she’s eaten yet. Do not be the girl who stalls on this one; they are too good to put off even one more day. The night before, pour the dried beans into a medium bowl and cover with water by an inch or two. Allow to sit for at least 8 hours. The next day, put a large pot. or dutch oven. over medium heat and add the olive oil & butter. Add the onions and peppers and sauté for 5 minutes, then add the garlic and cook for another 2 minutes. After slicing the kielbasa, add it to the pot and allow to cook for 5 minutes, stirring occasionally. While the kielbasa is cooking, find a bowl or measuring cup that can hold at least 6 cups of liquid. Into it, pour the chicken broth, Worcestershire sauce, and liquid smoke; set aside. Raise the heat slightly under the pot and add the ham shank and sear on both sides for 2 minutes each. Add the bay leaf, oregano, thyme, paprikas, celery salt, and black & cayenne peppers to the meat and vegetable mixture and stir to combine. Once incorporated, pour in the liquids and stir together well, being certain to scrape the bottom of the pot with your spoon to loosen the pieces of meat, vegetables, and spices that have cooked down. If needed, add enough water to cover the shank and then stir in the drained beans. Allow the mixture to come to a rolling boil and cook for 30 minutes. Reduce heat to simmer, stir thoroughly, cover pot and allow to cook for another 30 minutes. After a half hour has passed, remove the lid and allow to simmer for another hour, stirring it occasionally every 20-30 minutes. Check the doneness of the beans and cook an additional half hour or more depending on your preferred texture. If the mixture seems dry or not loose enough, add water, 1/4 cup at a time and stir to combine. When the beans have reached the desired doneness, remove the ham shank (it may be in a few pieces), and use a potato masher to smoosh (technical term) some of the beans to create a creamy consistency. You can also do this with the back of a spoon on the side of the pot. Allow the shank to cool slightly and then shred the meat. Discard any bones and add the meat back to the pot. To serve, spoon the bean mixture over a bed of white rice and top with chopped scallions. Add a few dashes of hot sauce if desired.